Steal my secrets to making these quick, pull apart pumpkin dinner rolls. Your family will love their soft, fluffy texture and mild pumpkin flavor at Thanksgiving dinner! 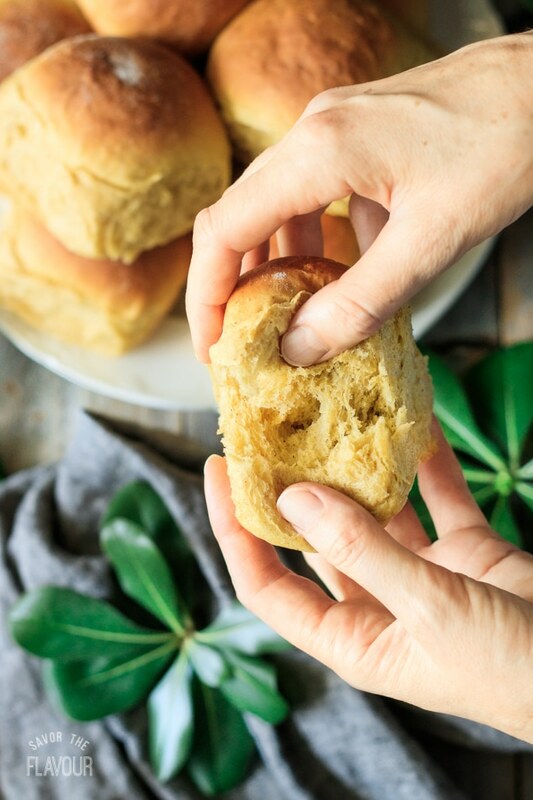 With just one hour of prep and cook time, you can have a batch of hot rolls out of your oven in a flash—or even make them ahead to save time. 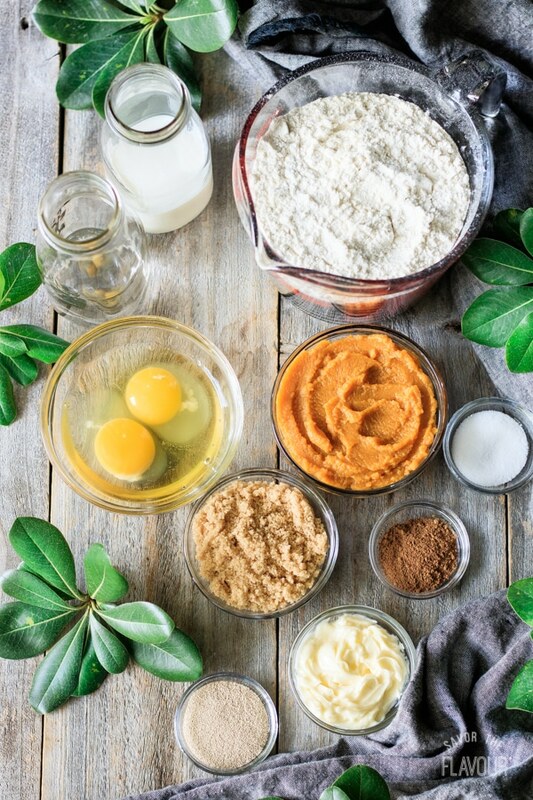 Measure out the ingredients before you start. It makes the whole process much easier! 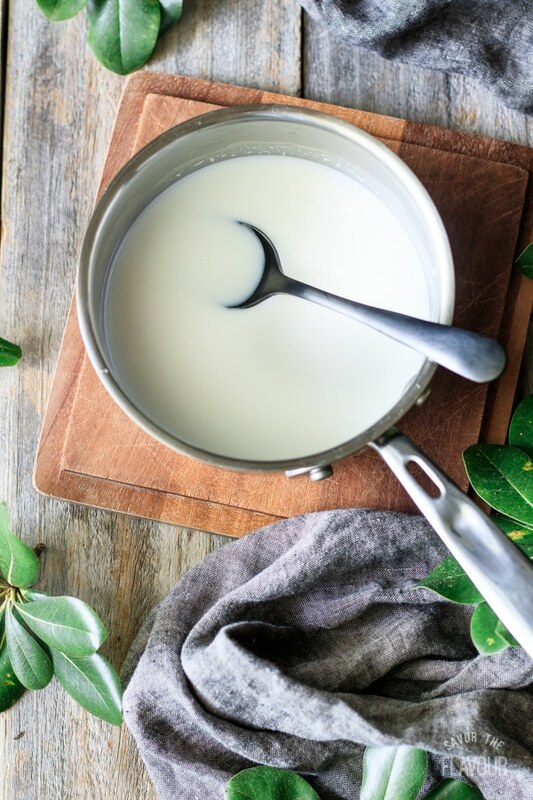 Warm the milk and water in a small saucepan until steamy. Make sure it’s no hotter than 115 F, or it might kill the yeast. 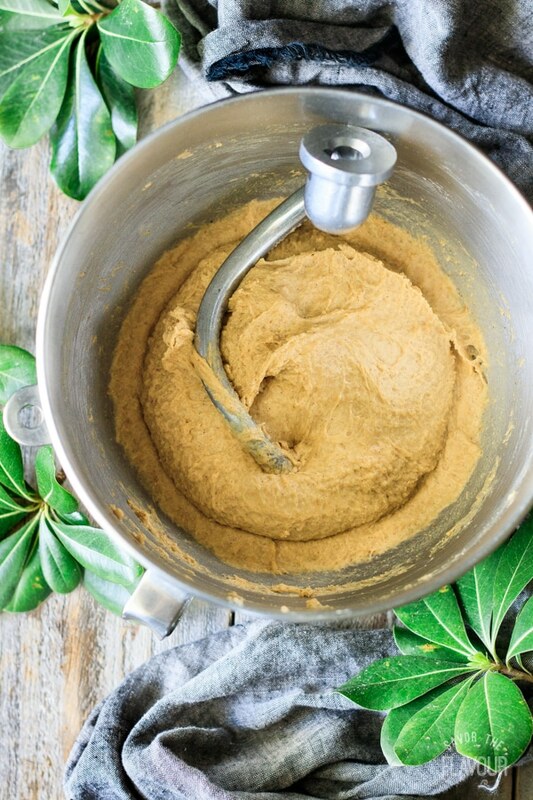 Put the flour in the bowl of a stand mixer, and add the salt and yeast on opposite sides of the bowl. Stir each one in with your finger. 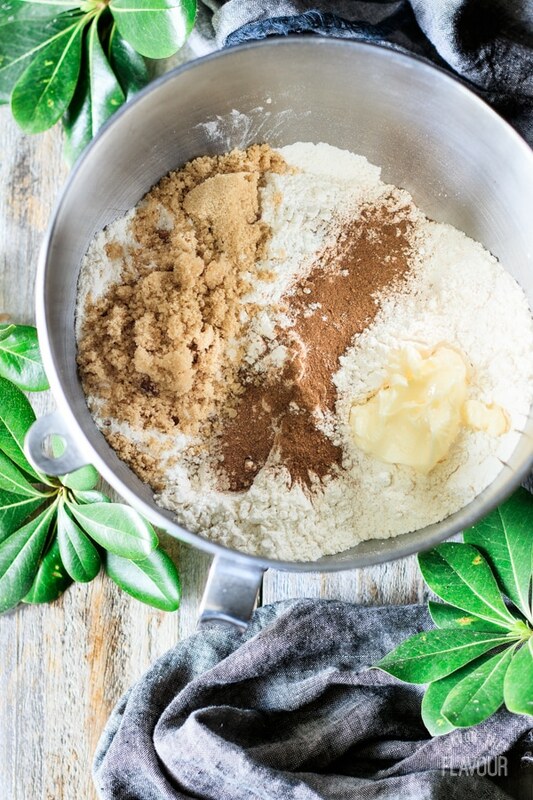 Add the sugar, butter, and pumpkin pie spice, then stir until combined. Dump in the pumpkin puree and eggs. Pour in half of the milk mixture. 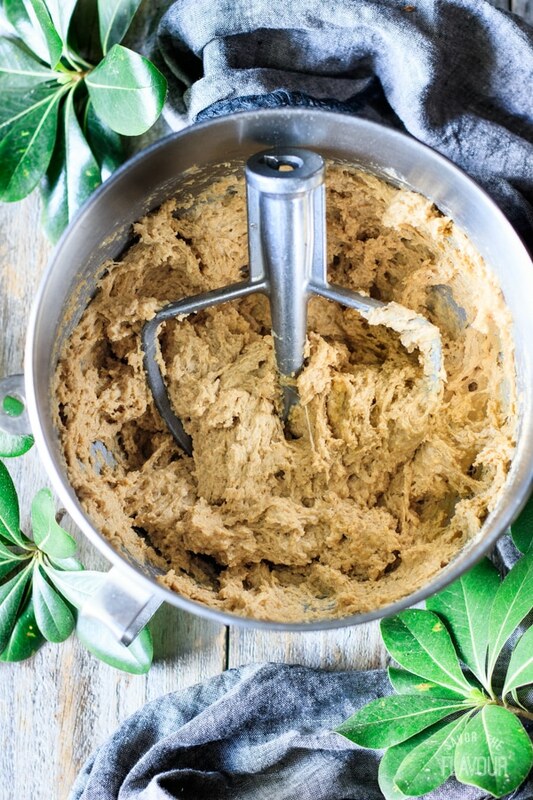 Turn the mixer on medium-low speed, and gradually add more of the milk mixture until you have a sticky dough. Knead for about 5 minutes with the dough hook, until it’s smooth and stretchy. Don’t know when the dough is ready? Check out the recipe instructions for my secret tip. Let the dough rise until at least doubled in size, about 1 hour in a warm place. 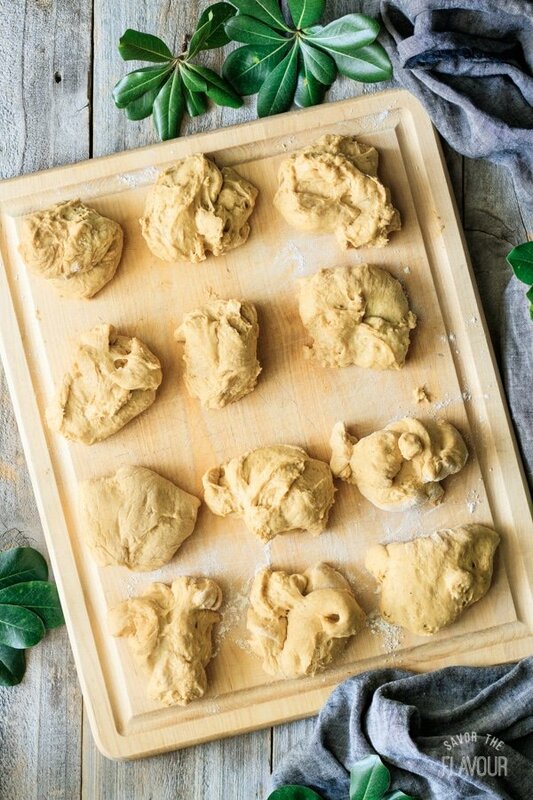 Punch down the dough, then divide into 12 pieces. Roll each piece into a tight, smooth ball and place in a buttered 9 by 13-inch pan. Cover with buttered plastic wrap and let the rolls rise until the dough is springy to the touch and their sides are touching, about 45 minutes. Bake at 375 F for 15 minutes, until nicely browned. The rolls should have an internal temperature of 190 F.
Enjoy these pumpkin dinner rolls while they’re still warm! Serve with cinnamon butter or garlic herb butter. 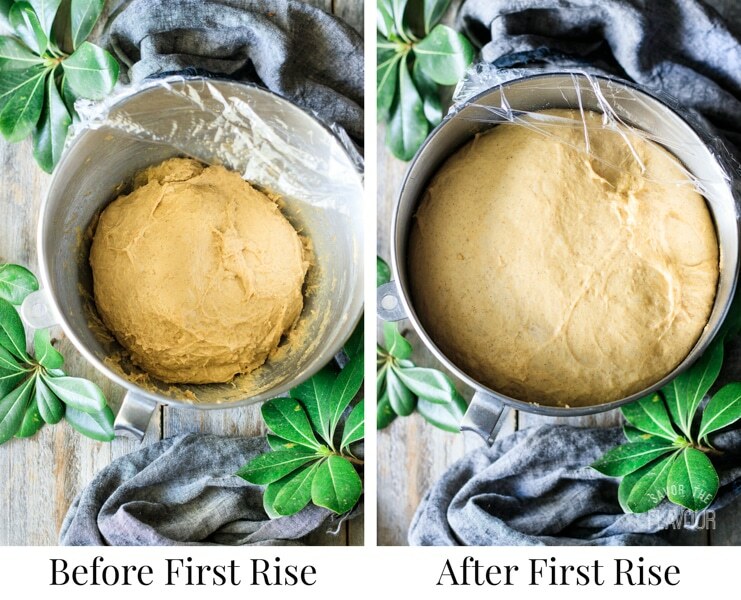 Mix and knead the dough, then let it do its first rise in the fridge overnight. The cold air of the fridge will slow down the yeast, but it will still grow. The next day, shape the rolls and let them rise as written in the recipe. They will probably take longer to rise than written, because the dough is still cold from the fridge. If you want to make the rolls far in advance, it’s best to freeze them once they are fully baked and cooled. See the storage and freezing tips below. 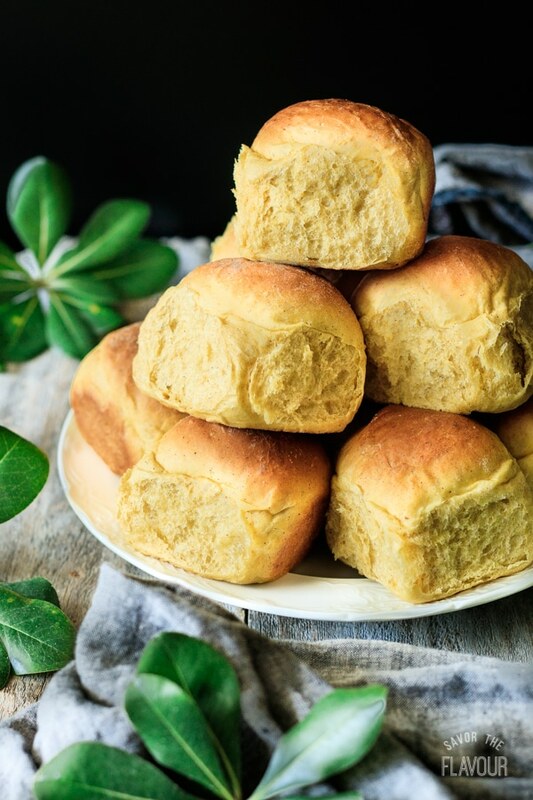 Store leftover dinner rolls in a zip-top bag or airtight container at room temperature. Storing them in the fridge will make them go stale. To freeze the rolls, wrap them in aluminum foil and seal in a zip-top freezer bag or airtight container. Freeze for up to 1 month. Reheat frozen dinner rolls for 20-25 minutes in a 300 F oven. Serve while still warm. Soften the butter quickly by cutting it in cubes and immersing it in warm water (not hot) for 10 minutes. Warming the milk and water for the dough encourages the yeast to work. Just make sure it’s not too hot; temperatures above 115 F can kill the yeast. Make sure the salt and yeast don’t touch each other directly. The salt can kill or stunt the yeasts’ growth. Use canned pumpkin puree instead of fresh. 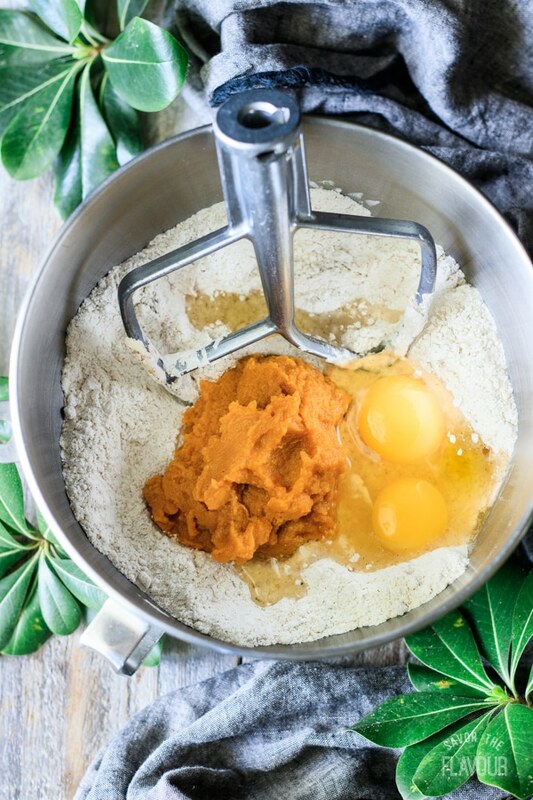 Homemade pumpkin puree is usually wetter than canned, which means you’ll have to add extra flour to the dough. Create a warm place for the bread to rise by placing the dough in a cold oven. Put a casserole dish filled with boiling water on the shelf under the dough. The steam will warm the dough, helping it rise more quickly. 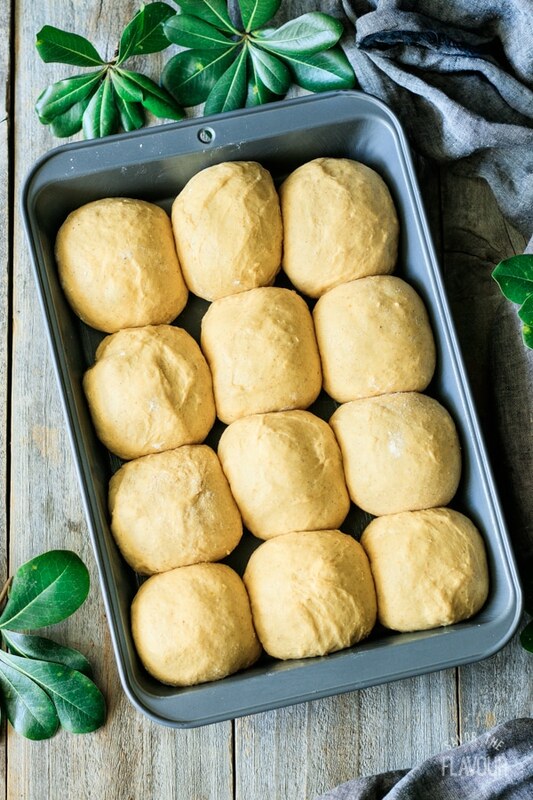 Roll the balls of dough tightly and smoothly to get beautifully shaped dinner rolls. 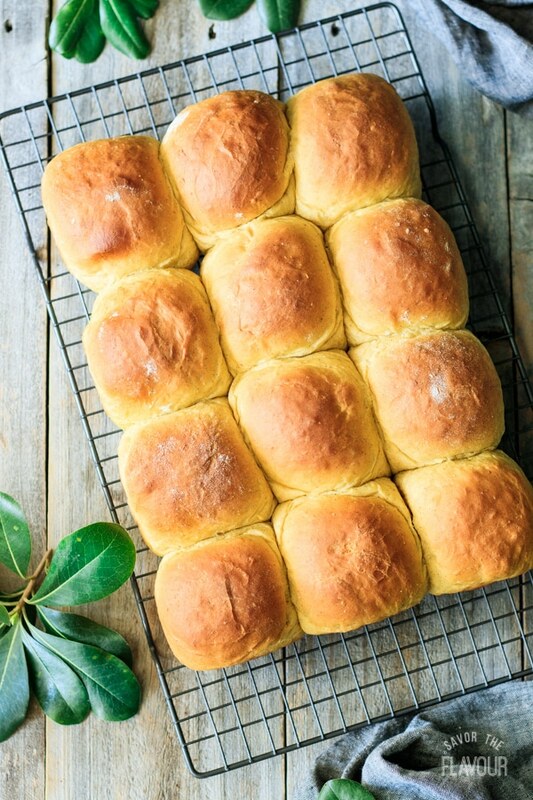 These other dinner rolls would make a lovely addition to your Thanksgiving menu. Garlic and Asiago Twists: caramelized garlic and Asiago cheese flavor these twisted rolls. 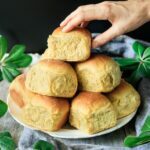 Soft and Fluffy Sweet Potato Dinner Rolls: no mixer needed for these delicious cloverleaf rolls. 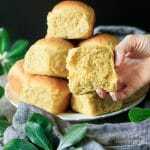 How to Make Fluffy Dinner Rolls: these simple, pull-apart dinner rolls are a classic everyone loves. 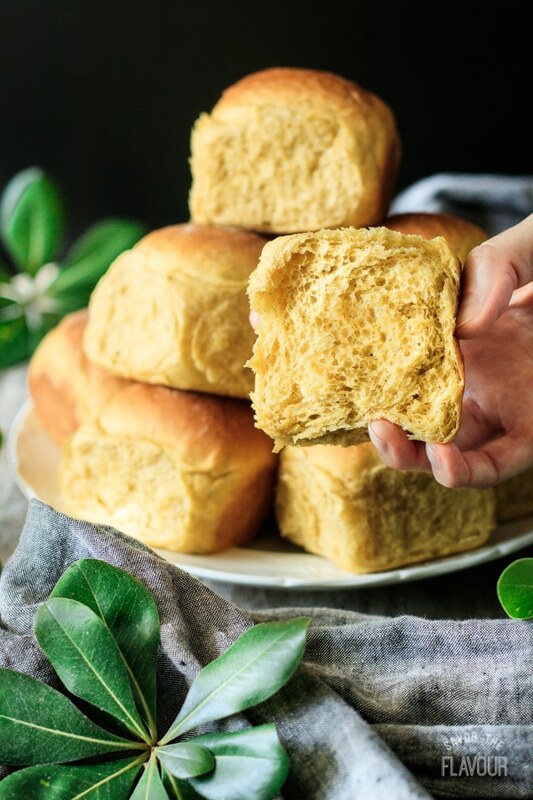 We’d love to hear how you enjoyed these pumpkin dinner rolls. Please leave a recipe rating below. Pour the milk and water into a small saucepan and set over medium heat, stirring occasionally. Once it begins to steam, remove it from the heat and let it cool until it’s 115 F.
Put the flour into the bowl of a stand mixer. Add the salt and yeast on opposite sides of the bowl, then stir in each one with your finger. Dump in the brown sugar, softened butter, and pumpkin pie spice. Mix with the paddle attachment on low speed until blended. Add the pumpkin puree, eggs, and half of the milk mixture. 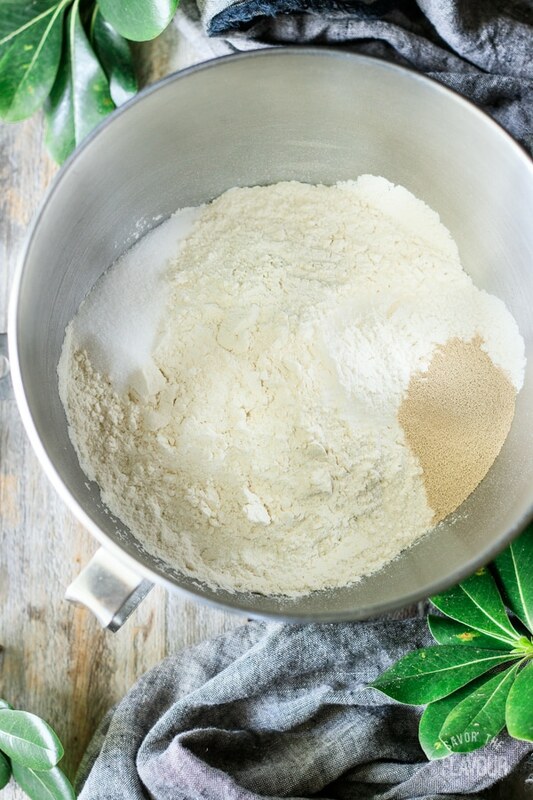 Stir on medium-low speed until all the flour is mixed in, gradually adding enough of the liquid to make a sticky dough. Switch the attachment to a dough hook and knead for 5 minutes on medium-low speed. The dough should be smooth and stretchy, in addition to passing the windowpane test. Test it by breaking off a lump of dough and stretching it between the thumb and forefinger of each hand to create a windowpane shape. If the dough is translucent in places without breaking, then it’s kneaded enough. If not, knead for a minute longer and check again. Form the dough into a ball, place back in the bowl, and cover tightly with plastic wrap. Let it rise in a warm place until doubled in size, about 1 hour. Lightly butter a 9 by 13-inch cake pan. Once the dough as risen, turn it out onto a floured surface and punch it down all over to knock out the pockets of gas. 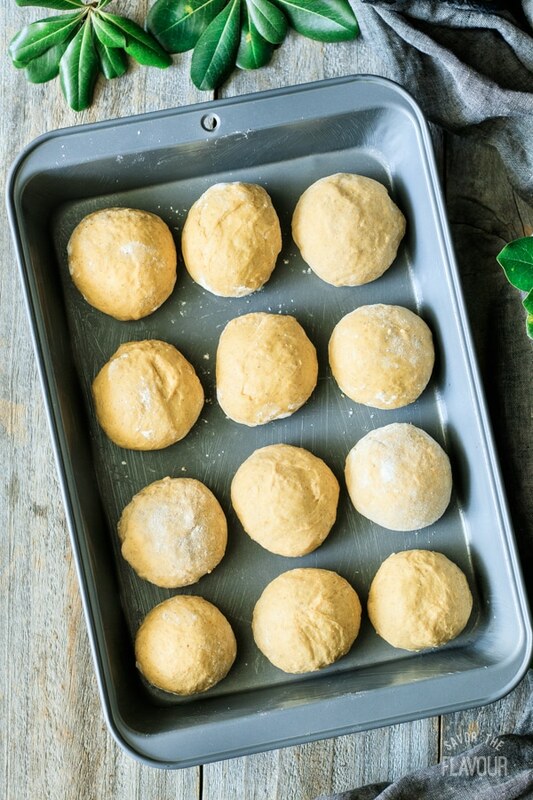 Divide the dough into 12 equal pieces, using a kitchen scale for accuracy, then roll each piece into a tight, smooth ball. Space the rolls evenly in the pan, then cover with a piece of buttered plastic wrap. 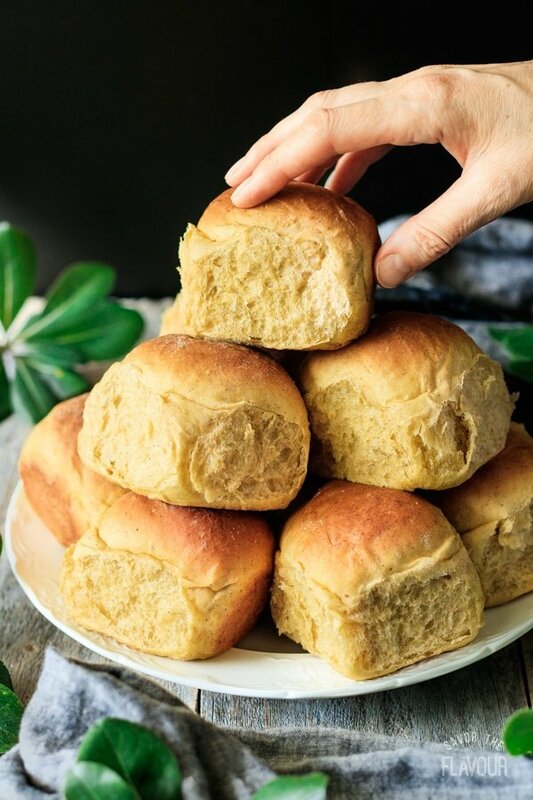 Let the rolls rise in a warm place until their sides are touching and the dough springs back when gently poked with a fingertip, about 45 minutes. 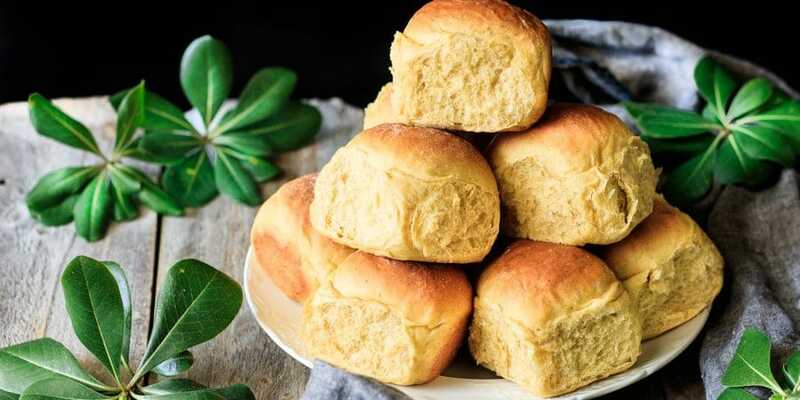 About 10 minutes before the rolls are done rising, preheat the oven to 375 F.
Bake the rolls at 375 F for 15 minutes, until they are browned on top and have an internal temperature of 190 F.
Immediately transfer the rolls to a wire cooling rack and let them cool for 5 minutes before serving. Create a warm place for the bread to rise by placing the dough in a cold oven. Put a casserole dish filled with boiling water on the shelf under the dough. The steam will warm the dough, encouraging the yeast to work. These pumpkin dinner rolls can be either sweet or savory. Try serving them with cinnamon butter or garlic herb butter, or make leftover rolls into tuna melts for lunch.